This year marks the 100th anniversary since the battle at Gallipoli and the New Zealanders’ Chunuk Bair offensive, considered to be one of the defining moments in New Zealand history and national identity. The Gallipoli offensive at Anzac Cove in Turkey is well documented by military historians. ANZAC bravery won wide praise for reaching Chunuk Bair’s summit which they briefly held, but it grew into an unsuccessful campaign, the remaining soldiers withdrawn and eventually evacuated at nightfall from the peninsula. Over two thousand New Zealand soldiers died there, and many more were wounded. PANZA would like to offer a tribute to New Zealand’s fallen in the form of verse authentic to the country at the time of World War One. The anonymous poem, ‘On the Death of Col. Malone’, found by PANZA Archivist Mark Pirie, appeared in the Stratford Evening Post, Taranaki, in 1915. He also came across a second poem tribute “Love is Mightier Than Death” mentioning Col. Malone in Papers Past, the National Library of New Zealand’s website. The subject of the poem Col. Malone (1859-1915), of the Wellington Battalion, was one of New Zealand’s prominent figures at Gallipoli, and successfully reached Chunuk Bair’s summit. In the attack on Chunuk Bair [Malone’s] resolute leadership was an inspiration to his men. He was ever in the van, scorning all danger. Early in the day a rifle that he carried was pierced by a Turkish bullet. This interested him, and he said he would keep it as a memento of the fight. Whenever he moved forward or along the trench he picked up the battered rifle again and carried it with him. Finally he was shot through the head by a bullet from a shrapnel shell that burst over the trench. 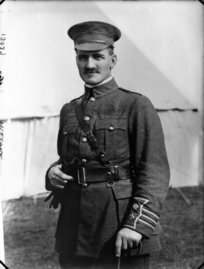 He sank back into the arms of one of his officers [Captain Hastings] and died painlessly on the highest point on the Peninsula attained by our arms. In 1982, Maurice Shadbolt’s play, Once on Chunuk Bair, considered that Col. Malone was killed by ‘friendly fire’ from a British fleet ship firing shrapnel shells over their trench but historians didn’t support this version of events (Shadbolt took it from Robert Rhodes James, Gallipoli, 1965, that includes Captain Hastings’ report). HIT BY BRITISH NAVAL SHRAPNEL. Malone was close up to the fighting line, on foot, encouraging his men when he was struck. He was hit by shrapnel from a shell fired by one of our own ships. Four or five bullets struck him. The ships were doing their best to support the troops, firing over their heads from the sea. The Turks were so close, and the position occupied by the battalion was so difficult, that a good many casualties on our side were caused the same way. However, my informant seemed to regard this loss as inevitable, and not to be set against the value of the support given at the time by the ships’ guns. He said that Col. Malone was exceedingly popular with his men; that he was a fine officer, and had done great service, which had been appreciated by his brigadier. The man also drew a picture of Malone’s energy and care for his men, and personal example to them. He said that each morning the colonel might be seen having a hard run to keep himself fit and in good condition; that often he had seen him with open shirt and sleeves rolled up, handling a shovel or axe or pick-axe, and showing how some piece of work should be done. A large number of tributes and obituaries for Col. Malone are in Papers Past searches near the time of his death. He was certainly a popular, well-known man in Taranaki and elsewhere who led by example. The New Zealand public had remembered him also in verse. Brave deeds amid a world of strife. Their swords, and at her call, they came. When youth’s high courage fiercely burned. Might ask from him great sacrifice. A soul that asks no resting place. On that distant battle shore. From a low and shameful fall. Save our land from evil fate. Many more poems about the Great War have been written, both from World War One and from contemporary writers looking back on the war. A newly published Australian anthology When ANZAC Day Comes Around: 100 Years From Gallipoli Poetry Project, compiled by Graeme Lindsay, features 200 New Zealand and Australian poets remembering war and dates back to the 1840s. The Printing Museum in New Zealand is working on several World War One poetry projects, including collections by two World War One New Zealand poets: Alfred Clark and Don H Lea. PANZA has featured some World War One verse in previous issues of Poetry Notes (including Don H Lea) and is always on the look out for New Zealand war verse. This small tribute in verse is but one of numerous mediums being used for this year’s remembrance.